I’m not sure where I first saw a salt pig. It was probably on a website that sells cooking, baking, and general kitchen supplies and equipment. It seemed familiar, like I had probably seen someone using one on TV, and I immediately wanted one. But in an uncharacteristic show of restraint, I didn’t buy it. I figured I’d see one in a store somewhere, so I could get a better look at it and decide if I really thought it would be a nice addition to my kitchen. So I looked around, and to my surprise, not only did I not find any salt pigs, I couldn’t even find anyone who knew what I was talking about. Even in kitchen and specialty stores, the clerks just stared at me like I had asked if they had any polite Frenchmen in stock. The closest thing I found to my elusive salt pig was a two-tiered bamboo salt cellar, which has taken up residence on my counter, but still didn’t fulfill my now single-minded quest to find le porc de sel. The problem was that by the time I realized I wasn’t going to find it in a store near me, I couldn’t remember where I first saw it. I surfed around the ‘net and found a lot of salt cellars, and even a few pigs, but not like the one that had first captured my imagination. Or was it my imagination? Had I dreamed the whole thing? 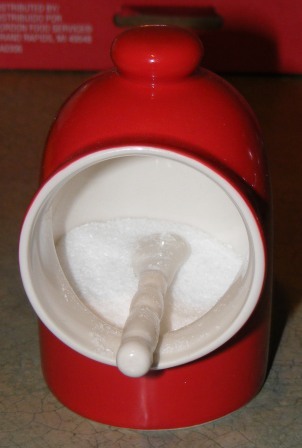 Was there a salt pig like the one I was looking for, or had my quest been in vain? Then it happened. I got a free shipping e-mail offer from one of the kitchen sites I visit and from whom I occasionally make a purchase. I wasn’t really in the market for ingredients or supplies, so I almost deleted the message. Then I remembered the pig, and figured it was worth a shot. And, lo and behold!, I found it! Not just one like it, but the very salt pig for which I had searched in vain these many months. I supposed it goes without saying that I ordered it immediately. Then something strange happened. In the week between when I purchased it and when the package was delivered, I started to wonder why I thought I needed a salt pig in the first place. Sure, it’s nice to have an open and readily accessible salt container at hand while cooking, but I had cooked for decades without one, so did I really need it? And would I actually use it? Maybe I wouldn’t even like it. When it arrived, I unboxed it, being careful to save the packaging it came in, lest I decided to return it. I liked the look of it. In fact, it was nicer than it had looked online. I filled it with salt, put it on top of the stove, and soon found myself reaching for it whenever I cooked. Before long, I could hardly remember cooking or baking without it. Before you read this, you may not have known what a salt pig was, and you probably never thought you needed one. But I’m telling you, you want this. It’s the best invention since, well, salt.